On Tuesday, October 27, Bro. 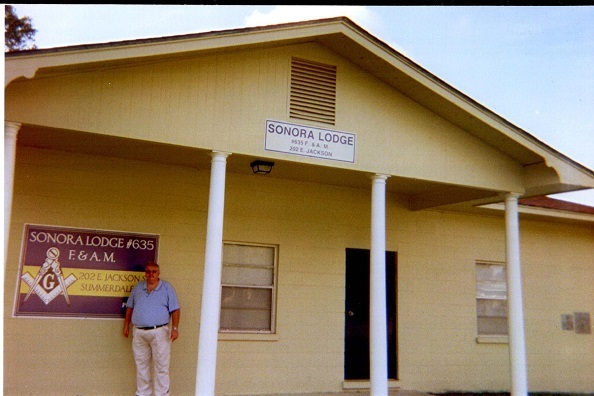 Dan Kemble visited Sonora Lodge No. 635, in Summerdale, Alabama. Worshipful Master Jim Eddins, Secretary Dean Mott and the Brothers of Sonora Lodge were most hospitable and welcoming to their guest. Bro. Dan was especially happy to learn that two of the Brothers at Sonora Lodge were fellow Kentuckians. Bro. Tim Cosby hails from Middlesboro, Kentucky and Bro. Randy Smith was raised at Glencoe Lodge No. 498 in Glencoe, Kentucky. All present had an enjoyable discussion on the ways that Alabama Masonry is similar to, and differs from, Kentucky Masonry. Bro. Dan found that Freemasonry is alive and well in South Alabama and welcomed the Brothers of Sonora Lodge No. 635 to visit Elvin E. Helms Lodge No. 926 whenever they could. Most Worshipful Grand Master Cloyd J. Bumgardner has appointed Bro. Dan Kemble, Past Master of Elvin E. Helms Lodge No. 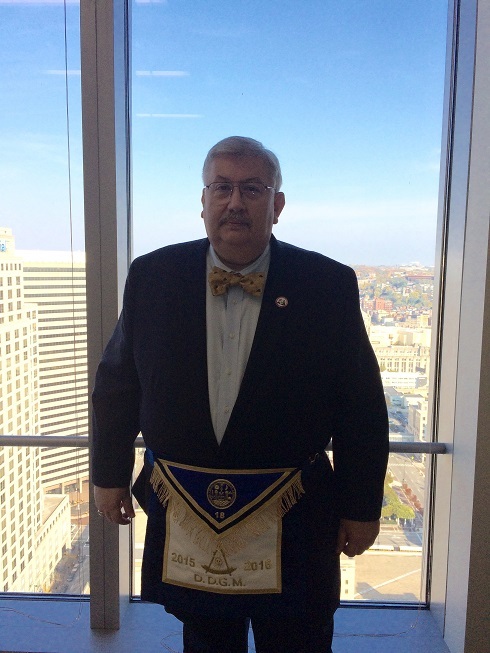 926 as District Deputy Grand Master for District 18 of the Grand Lodge of Kentucky for the Masonic year 2015-2016. Bro. Dan served as Master of our Lodge in 2014. Other current members of our Lodge who have served as District Deputy include Bro. LC Harper (PGM), Bro. Ed Tanner, Bro. Bob Fobbe, Bro. Mel Kinser, Bro. Garry Kelly and Bro. Al Cummins. While our Lodge may be small in number, its spirit of brotherly love and its commitment to Freemasonry is recognized by the appointment of these brothers to positions of leadership in our District. This paper was presented by our Junior Deacon, Brother Adam Gross who is also the Master of Newport No. 358. It is understood in a Lodge of Entered Apprentice Masons that what we have all come here to do is to learn, to subdue our passions, and to improve ourselves in Masonry. The first things we saw for ourselves in a Lodge of Masons on any degree were the sacred text of our faith, in my case The Holy Bible, The Square, and The Compass. These three items together are the foundation of our respective faiths and the foundation of Masonry. In talking about what we have come here to do I want us all to focus on The Compass for a few minutes and talk about what it is designed to teach us. We all know that The Compass is intended to teach us to keep our passions within due bounds toward all mankind, more especially Brother Masons. We are all ritualists in this Lodge and know those words quite well. How many of us have ever stopped and examined this lesson of Masonry more carefully? Let us take a few moments to do this together tonight and look more closely at why The Compass and The Square are so important to our fraternity that they share a place of such great importance in our Lodges with The Holy Bible. Passions are powerful or compelling emotions or feelings. People who are ruled by their emotions or beliefs are passionate. Being ruled by your emotions and beliefs can lead you down a road of narrowmindedness, bias, intolerance, discrimination, and bigotry – things Masons are Charged never to be. So what does The Compass teach us about subduing our passions? It teaches us that we should never allow our beliefs and emotions to so cloud our vision that they lead us to do immoral things, or bring harm to others. In short, using The Compass in our daily lives will set us free from the beliefs and emotions that might otherwise cause us to hold prejudice against other people, discriminate against them, to be intolerant of them – or to become a bigot. The use of this working tool in our daily lives will set us free from these feelings and beliefs that lead us to be irrational. None of us has been, or should have been, taught to hate or be intolerant of any other person or group of people in Church or in Lodge. We are constantly reminded of the universality of Freemasonry. Within these walls we are taught to love the human family without exception regardless of their faith, creed, color, or opinion and more especially our Brother Masons. Over the journey of a lifetime we can learn to truly love our fellow man by constantly keeping The Compass and its use at the front of our minds, and more especially our Brother Masons for helping us to achieve this level of peace and compassion between ourselves and the world at large. This is an institution that says, very generically, that we make good men better. I want to remind every Brother here, that at our most basic level, Freemasonry is a support group for good men fighting to be good men and become great men in an immoral world – just like salmon, Masons swim against the current. This is where we come to escape the horrible things that go on in this life outside of our walls. We can be comfortable here, loosen up, and feel as safe, if not safer, as if we were in our own homes. For the time we are blessed to spend together we don’t have to feel strange or unusual – we’re all here to do the same thing. We challenge ourselves and one another to be better men the next time we come back to this most special place. In the Entered Apprentice Lodge we are taught that The Compass is dedicated to the Craft, for by a due attention to its use we are taught to circumscribe our desires and to keep our passions within due bounds. In the Fellow Craft degree we are reminded that we are speculative Masons and that through speculative Masonry we learn to subdue the passions, act upon the square, keep a tongue of good report, maintain secrecy, and practice charity. In the Master Mason degree we yet again see The Compass and its central role and unmistakable importance in our Craft. This time the extended points of The Compass are applied to a new Master Mason’s chest, the moral being that as the most value parts of man are contained within the breast so are the most excellent tenets of our institution contained between its extended points – friendship, morality, and Brotherly love. The sacred texts of the world’s three great religions agree it is our duty to the Grand Architect of the Universe to be tolerant of one another and learn to love one another. Accept, befriend, and love every member of our human family without exception. This is the lesson taught to us by use of The Compass. By this working tool of ancient operative stonemasonry we, as speculative Masons, have something we can put our hands on to teach us this very same lesson. We are taught in our respective Churches and simultaneously within Freemasonry, by way of The Compass, to love and be tolerant of one another without regard for faith, creed, color, or opinion. This is one of the most excellent tenants of our institution and of our profession, as Masons, and what is meant when we speak of the universality of Freemasonry. This is what we all have said we came here to do. I challenge all of us to make regular use of The Compass. With its aid we can become the better men we aim to be, and once we have mastered it, we will be Free. Freemasonry insists on belief in a Supreme Being – a Creator – a single omnipresent, omniscient, omnipotent, infinite being. That means that we accept men of all faiths that are monotheistic or polytheistic, providing their faith of choice has one Supreme Being above all others. This is why Freemasonry accepts men of the Hindu faith – while it is a polytheistic faith, they believe in one Supreme Being who is Master of all, and so revered they do not mention His name directly, except as Freemasonry teaches, with the reverence and awe due from a creature to his Creator. In regards to the universality of Freemasonry, this means that Freemasonry regards the Supreme Being of every faith as the ONE Supreme Being. Every religion has a different name for Him – God, Yahweh, Jehovah, Allah, Trimurti – but we are all speaking of the same Creator regardless of what we call Him. So we do not promote one faith over another or marginalize any faith, Freemasonry has adopted our own terminology that represents the one and only eternal and infinite Creator of our universe – Grand Architect of the Universe. That we reference God with this phrase instead of the name of choice from any faith on Earth underscores that we accept all good men regardless of their faith and fully understand that there is only one eternal and perfect Creator. It doesn’t matter whether you call Him God, Yahweh, Jehovah, Allah, or Trimurti – we are all praying to and have our faith in the one true Supreme Being – The Grand Architect of the Universe. To download a copy of Brother Gross’ paper, click here.